American students are apparently afraid of books with too many pages. The solution that publishers have came up with to is to number different sections of the book separately. Thus my previous book, the second edition of Fundamentals of Molecular Evolution was listed as xiv + 481 pp. That is, 14 pages of front material (title, acknowledgements, dedication) plus 481 pages of text. This was a significant increase in pages from the first edition, which was listed as xv + 284 pp. My newest book, Molecular and Genome Evolution, which was published with the same publishing house, is listed as xvii + 612 pp + 54 LC + 34 I, in other words 17 pages of front material, 612 pages of text, 54 pages of references, and 34 pages of index. It seems that 612 is significantly less terrifying than 690 (or 707 if one includes everything in the book). Under this system, the current draft of my book is xxiv + 270 pp + 6 LC + 4 I—not counting the colophon, which is after the index. Should the appendix have been in the 270 pp, where I put it, or in the “LC” count? Should the blank pages that exist only so that chapters start on a right-hand page be counted, as I did, or not? Obviously, my book is much lighter weight than Prof. Graur’s (if weight means anything in an e-book-only publication), and I clearly need to beef up the index (though maybe not to four times the current length, which is what it would take to be comparable to his index/text ratio). But 54 pages of references seems excessive for a textbook—even one with 612 content pages. No student is going to look up even 1% of those references. That depth of references is more appropriate for review article or a research monograph than for a textbook. Of course, many scientists don’t really distinguish between research monographs and textbooks, so perhaps it really is a research monograph, in which case the level of citation seems appropriate. Perhaps Prof. Graur’s book, probably aimed at grad students or postdocs, is not typical of books aimed at college freshmen and sophomores. Looking at a textbook I happen to have on the floor by my desk, Matter and Interactions, which I haven’t put away since teaching/learning physics from it 3 years ago, I see xxiv + 1080 pp + 19 I, not counting the endpapers, which add another 3 pages of text (useful reference material). This book seems to have no references—not at the end, not in each chapter, and not even occasional pointers to more information for curious readers. The indexing rate is 1.76%,which is only slightly more than my 1.48%, so I may not be as far off the mark in the amount of indexing I’ve done as I feared. I am complete agreement that computing should really be taught within teachers’ disciplines, such as math or physics. Computing is a literacy. We write and do mathematics in science. We should also do computing in science. Current constraints make that hard to get to. Why should mathematics or teachers want to use computing? It’s harder (in the sense, that it’s something new to learn/use). And it doesn’t help them with their job. Remember the posts I did on Danny Caballero’s dissertation? Computing does lead to mathematics and physics learning, but different from what currently gets tested on standardized tests. Why should people who make up those tests change? To draw more people into computing? Recall how much luck we had getting CS into the new science education frameworks. Who would pay for it? We can get Google to pay for more high school teachers to learn CS — that leads to more computer scientists that they might hire. We can get NSF’s CISE directorate to pay for CS10K — that leads to more CS workers and researchers. Who pays for math and physics teachers to learn computing, especially when learning computing doesn’t help them with their jobs? Finally, in most states, computer science is classified as a business topic. Here in Georgia, the Department of Education did announce that only business teachers could teach computer science. The No Child Left Behind (NCLB) Act requires teachers to be “high qualified” in a subject to teach it. If CS is classified as business, then it makes sense (to administrators that don’t understand CS) that only business teachers are highly qualified to teach it. Barbara Ericson fought hard to get that changed, since some of our best CS teachers are former math and science teachers (who date back before CS became classified as business). I don’t know if, in other states, math and physics teachers are disallowed from teaching CS. It’s a big, complicated, and not always rational system. That the system is big and irrational is not news to anyone, and the Georgia Department of Education may be about as silly as Departments of Education get. I have no idea how to fix dysfunctional government bureaucracies, though, so I won’t comment further on that point. Learning to use programming effectively can help physics and math teachers do their jobs better. Companies like Google and federal agencies like NSF will pay for teachers to learn computational methods, not just for straight CS teachers. For the first point, I’m going to have an uphill battle to convince Mark, because he has a carefully done research study that Danny Caballero did for his PhD on his side, and I don’t have 4 years of my life to spend working full time on the question. I read Mark’s posts about Caballero’s dissertation, I even wrote about them when the posts first came out (and I started another draft post, but abandoned it). I agree that Caballero’s results are not encouraging, but I don’t believe that a single experiment at 2 sites decides the issue for all time. Caballero showed that a couple of mechanics courses that taught physics using Matter and Interactions did not spend enough time on the concepts of the Force Concepts Inventory (a small but important subset of the concepts of a first physics course), and so students did not learn as much on those topics as in a traditional class. He also showed that students made typical programming errors that reflected poor understanding of both physics and programming, and that students had less favorable attitudes toward computational modeling at the end of the course than at the beginning. The programming errors Caballero found were typical of the errors seen after a first programming course also—if we can’t teach students to avoid those errors when the entire course is focused on programming, it is not surprising that a physics course in which programming is a small add-on also produced students who can’t program well. Caballero’s thesis study was pretty convincing that those implementations of the intro physics course using computational approaches were not very successful at teaching the concepts of the Force Concepts Inventory. I’m not convinced that the problems are inherent to using computational approaches to teach physics though—just that these courses had not yet been optimized. It is indeed possible that Mark’s conclusion (computing doesn’t help teach physics or math) is true, but I think that is too big a generalization from Caballero’s results. Note that an earlier paper on which Caballero was an author showed that the M&I students showed better gains than students in a traditional course on a BEMA test (Electricity and Magnetism, rather than the mechanics topics of the FCI). So even Caballero’s results are not as uniformly negative as Guzdial paints them. Personally, I liked the Matter and Interactions book, and I think that its approach helped me and my son learn physics better than we otherwise would have, but we’re hardly the typical audience for a first calculus-based physics course, so I don’t want to generalize too much from our experience either—Caballero’s results (positive and negative) are from 1000s of typical students, not 2 very unusual ones. Teaching physics and math teachers to program can help them do their jobs better—even if they don’t teach programming to students! There are other ways that programming helps them—for example, Matt Greenwolfe spent a lot of time programming Scribbler 2 robots to be better physics lab tools than the usual constant-velocity carts. Other physics teachers are doing simulations, writing video analysis programs (I contributed a little to Doug Brown’s Tracker program), improving data logging and analysis programs, and so forth. A lot of math teachers are using GeoGebra to make interactive geometry applets (and, more rarely, to have students do some programming in GeoGebra). As for my second point, there are already many corporate and federal programs to try various ways of improving STEM teaching (the CS portion of that is actually tiny). To convince them to spend some of that money on teaching math and physics teachers to program, we may need some better use cases than the intro mechanics courses that Caballero studied—or we may just need to re-examine those courses after the instructors have done some optimization based on the feedback from Caballero’s study. Although my son has taken both the AP Physics C: E&M exam and the SAT2 Physics exam already, we haven’t finished the Matter and Interactions book yet, so we’ll keep going over the summer to finish off the last 3 chapters (23: Faraday’s Law, 24: Electromagnetic Radiation, 25: Waves and Particles). He read the chapters before taking the exams but has not done any exercises or labs for them yet. Chapter 23 includes inductors, so we’ll probably do some inductor labs, looking at current in response to a step change in voltage and perhaps making an LC oscillator. I have some 220µH inductors, so we should be able to do current changes slow enough to track with the Arduino data logger and make an audio frequency oscillator. We may try winding our own air-core inductors with different core diameters, and measure the inductance in several ways (say by fitting a time constant to the current change, with a frequency measurement of an LC oscillator, and by nulling a bridge circuit comparing to a known inductance). We’ll probably also do some sort of eddy current demo (dropping a magnet through a copper tube, for example). Homework exercises for Chapter 23: 23P29, 23P30, 23P32, 23P34, 23P35, 23P38, 23P40, 23P42, 23P43, 23P45, 23P46, 23P47, 23P51, 23P52. We are way behind on physics—my son took the AP C: E&M test before we even got to Faraday’s Law. He read through the last 3 chapters of Matter and Interactions in 3 days, rather than the 8 weeks we had originally planned, and he hasn’t done any of the exercises in those chapters yet. Because he is planning to take the SAT 2 Physics test this Saturday, I decided that he should at least have a cursory familiarity with Snell’s Law. Since there wasn’t time or energy for a problem set, we did a lab instead. I had noticed when playing around with the violet (405nm) laser pointer, that the water in the fish tank fluoresced brightly. Laser beam causing fluorescence of water in fish tank. The beam comes in from the right and is reflected off the water-air interface. The blue is probably from bacterial cells in the water, and the red from chlorophyll from algae growing on the walls of the tank. We get the blue fluorescence even from water right out of the tap, though not as brightly. Despite the very inaccurate measurements, my son got a decent estimate of the index of refraction of the water. 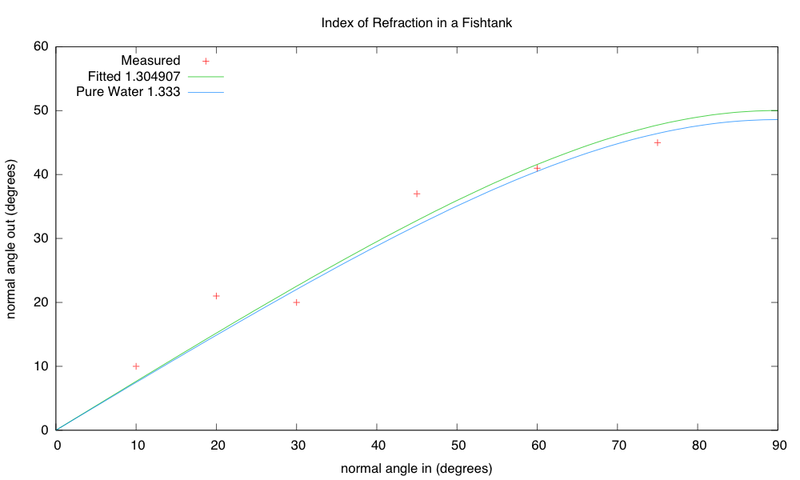 We don’t know the true index of refraction, since the water has a lot of “stuff’ in it. I’m sure that with more careful measurement, we could get much less scatter around the theoretical curve, but we were tired at the end of the day and couldn’t be bothered to do the measurements right. We finally finished off Chapter 21 of Matter and Interactions today, about 2 months behind my original schedule, having been repeatedly distracted. We never did get around to measuring the magnetic field of a coil as a function of distance or current, either, though we’ll probably get back to trying that after the AP exams. It looks like there is a chance my son will get to take the AP CS and AP Physics C: E&M exams this year, even though my first 5 attempts to find a place for him to take them failed. He needs to take the late exam for AP CS, since it conflicts with the Oregon Shakespeare Festival field trip and no one in the County offers Physics C—my attempts to get one of the high schools to offer the exam (which is at the same time as Physics B) all failed. His consultant teacher is trying to arrange to be the proctor for him on the late AP CS and the late Physics C: E&M exams (it is now too late to register for the regular exams) through another high school in the same district. I’m hopeful that she’ll be more successful in moving the bureaucracy than I was as an outsider. Of course, he’ll probably never get any credit for taking the exams, since many of the schools he is applying to don’t do AP credit anyway, and he’ll have to retake physics at any of the schools he’s likely to choose. But the exams will help validate that he has done rigorous work in physics, which should help him get into the colleges that would be a good fit for him. The AP CS exam is so low level that all it validates is that one has learned some Java syntax—but it might help with admissions offices also, as most will not be familiar with the new Art of Problem-Solving Java course. In any case, we have to speed up a bit on the physics, despite the distractions, so here are the problems for Chapter 22 “Patterns of Fields in Space”: 22P15, 22p16, 22p18, 22P22, 22P23, 22P25, 22P29, 22P31, 22P33, 22P37.